The Economist notes that America may be growing tired of “Yes We Can,” inevitably dulled by 18 months of excitement about Barack Obama. Which reminds us of the new VW Beatle. 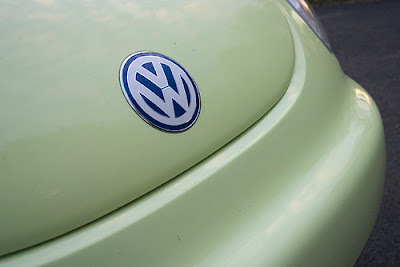 In 1998 Volkswagen released a curvy new take on the Beatle, an egg of sheet metal over the Golf Mk4 platform (leading the few grumpy critics at the time to call the Bug “a Golf in drag”). Consumers drooled. We couldn’t get enough; heads turned on highways, cars sold out, VW ran billboards stating “Other Cars Are Beginning to Look Funny” … yet eventually the love affair stalled. People always need something new. Keith Rayner and Alexander Pollatsek recently hypothesized, in The Psychology of Reading, that humans are trained to seek the “newness” in communications to help make sense of the world. We are awash in old data and need to find new information to survive — and if we don’t see something new, a sort of “error signal” eventually occurs. Rayner and Pollatsek were assessing how people digest words, but the same holds true for the world at large. New information finds deer, improves crop yields, teaches you how to brew beer, tie knots, build machines, win wars. If you don’t find the new, new thing, your competitor does … and your genetic chance of survival pales. If you are among the 45% of likely U.S. voters who would now pick Obama, your motive may be his branding as “hope,” something new, a breath of fresh air. The campaign is starting to falter, with McCain picking up steam. It may not be the attack ads or the economy or the war or anything more than the fact that after 18 months, something new doesn’t seem fresh any longer. If you’re into data, and we know you are, StateMaster offers a fun, free dive into U.S. consumer behavior. The site compiles data from the U.S. Census, the FBI, the National Center for Educational Statistics and other sources for MRI-type charts and graphs on demographics, housing, energy use, entertainment, crime and transportation. There are big holes — not much in tying consumer demos to product usage and media — but it’s always cool to play with correlations between variables. 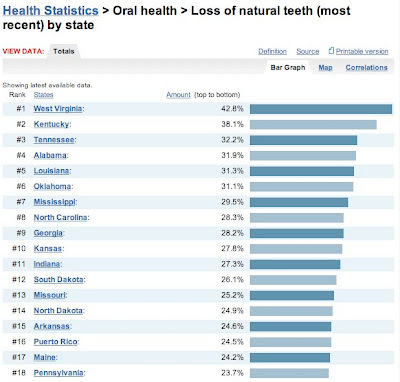 Such as dental health and blue vs. red states. We’re just saying. George W. Bush isn’t out of office yet and a movie is about to be released with Oliver Stone’s take. Barack Obama was set to announce his running mate today, but was forced to fire off the promised text message to followers at 3 a.m. because the news was scooped. John McCain responded to the Joseph Biden pick with a new TV ad out the same day. Whew. Beyond this dizzying rush of get-it-out-now, we wonder, what is the psychology of immediacy that makes stories seem so much more relevant? Are humans wired, from 30,000 generations who survived famines, wars, Ice Ages and hunting, to perk up when something new happens — cause if we don’t listen, we die? And will this itch eventually mean information is only relevant if it is 2 seconds old? News emerged this week that Disney’s copyright on Mickey Mouse may not be enforceable. Seems Disney’s official story is Mickey was created by Walt Disney Co. in 1928 … and an archivist claims to have found papers proving Walt Disney Co. didn’t exist as a business back then. Whoops. This is rather stunning news, since Disney’s Mickey Mouse franchise is valued at about $3 billion. Now, we can’t imagine tangling with Disney’s lawyers — acts of Congress have been rallied to extend Disney’s copyrights — but it all points out to the problem with enforcing ideas in today’s world of free creation. 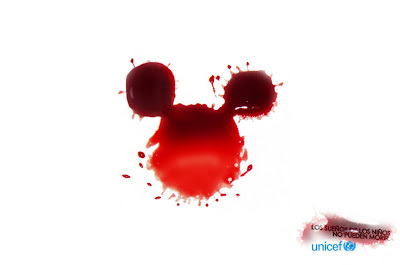 Unicef did a riff on Mickey above, with this OUT, Santiago, Chile campaign stating “the dreams of the children cannot die.” Copyright violation? Or coloring an idea in the public domain? Is there really a need to secure your own brand? Can an unsecured brand be more valuable than a secured brand? Not only is it becoming an impossible task to secure brands, with new ways of communication emerging everyday. but also i would argue it is ridiculous and counterproductive … Why shouldn’t you secure a brand? Because you don’t want to control the conversation. An uncontrolled conversation is more valuable. It gives you real feed back about your brand good and bad. Good points. On one hand, $3 billion in value must be defended. On the other, brands now, like information, want to be free. One problem with social media is it often feels removed from reality: A bunch of people, alone in their office or bedroom, typing away to virtual online relationships. Zuku brings a touch of reality back with a service allowing public speakers to receive instant feedback from their audience’s cell phones. This seems blindingly obvious — hey, what if the audience could chime in? — but is something few public forums provide. The application could provide data mining insights as well; imagine if a large corporation such as GE, constantly training the 10 percent of its workforce that turns over each year, could analyze patterns in employee questions and concerns and then do something about it. The anonymity and spontaneity of real feedback. Listening to audiences in a new way. Could work. Timo Paloheimo of Helsinki, Finland, recently read a NYT article about Google becoming a media company … and decided to do something about it. So he’s launched the search engine Google Minus Google, which removes all Google-owned media properties such as YouTube and Knol from Google’s own search results. The result? 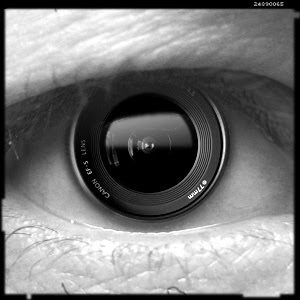 Search results more focused on information, without the chatter of blogs and news and video getting in the way. It’s all a rather pointed critique of Google losing focus as it dips into rich media and away from pure information, and perhaps even conflicts of interest as Google search results now begin pointing to its own media properties. Better? Not sure, but we’re bookmarking the search site. Via Angela Natividad at AdRants. We’ve often wondered at the failure of smart tech designers like Apple or Samsung to create a successful convergence device. One theory is people don’t want a single interactive gizmo. Humans have three zones of communications: a passive zone in which you view things, like TV or live theater, from a distance; an interactive zone about 2 feet from other people or your laptop screen; and a personal zone 6 inches from your mobile. This could be psychologically based, tied to your cave ancestors listening to stories by campfires vs. whispering intimately to their lovers. Thus we have big TVs and small cell phones, and no single device does everything. Steve Rubel notes that convergence may come after all, with Intel and Yahoo creating a Widget Channel that will embed computer-style interactivity onto the big screen. It would be an advertisers’ bonanza to have customers be able to click into the commercials for more information, or even purchases. We’ll see if people used to watching fire from a distance now want to play with it. Say you’re a marketer who drops $1 million a year on direct mail into homes, some of it First Class because you need to hit consumers in a timely manner and the delivery curve of standard-class mail can be unpredictable. What if you could send standard mail instead, save hundreds of thousands of dollars, and still know exactly when the mail is hitting homes? 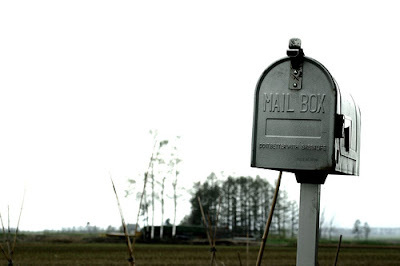 TrackMyMail.com, an “intelligent mail” firm recently acquired by Pitney Bowes, offers just this solution. The service takes the PLANET codes that allow USPS to track mail delivery and converts them into usable data for marketers. For example, mailings that promote time-sensitive sales dates could be monitored for delivery slippage, and if delays occur a marketer could increase radio to support the campaign. Call center staffing could be adjusted to match inbound responses tied to mail delivery, removing dreaded pinch points in the marketing sales funnel. Or in the perhaps the best use, marketers could coordinate other channels such as outbound email with the date mail is delivered in the home. “Check your mail today for our special offer” would certainly boost open and response rates. Nice service. Worth a look if you run integrated campaigns that include direct mail. Tip via Marlene Ryan. U.S. Army Captain Benjamin L. Willard is now posting on Twitter, which is strange because he’s a fictional character from the film Apocalypse Now, which in turn was a riff on Joseph Conrad’s novel Heart of Darkness. Which means we are three levels of fiction removed from a very clever writer. One unusual aspect of social media like Twitter is it combines real-world communications with souls hiding behind masks or complete fantasies. It’s a bit surreal to exchange tips on advertising strategy with experts in Philadelphia or Melbourne and then switch to a newsflash from a pseudo-Martin Sheen 75 klicks above the Do Lung bridge. This also points out to the need to secure your own brand identity on social-media sites before imposters or jokers take over your name. UK ad guy Dirk Singer recently found that 7 out of 10 FTSE 100 firms have unsecured brands at risk for “brandjacking” on Twitter. Will convergence accelerate the death of journalism outlets? Variety reports that Newsweek.com and Washingtonpost.com will provide seven hours of streaming video from the U.S. political conventions, which turns the print vehicles into, well, a not-quite-as-good CNN video feed. The move is expected, with high-speed broadband access breaking the 90% mark among U.S. active internet users and online video now the new new thing. In the short term, this could increase demand (and audience) for old newspaper and magazine outlets. But long term we see the falling cost and increasing professionalism of video broadcasting moving beyond top media outlets to bloggers, individuals, academics, students. The end game for media may be a Google News feed, in which top stories are pulled from millions of sources with no media ownership in the middle. Good for viewers. Not so good for Newsweek or Washington Post, or the advertisers trying to join the fray.